K-PAX Racing's attempting to turn an off-the-line Volvo C30 into a world-beating race car in 60 days. Driver Robb Holland's going to give us weekly project updates. Part Eight: the finale. —Ed. One grocery getter turned world beater in 60 days as promised. Don't believe me? Well then check the vid we've included for your viewing pleasure. The first laps ever turned by our beloved Project Grocery Getter. You may recall that before we dove into this project, we took our bone stock 2011 Volvo C30 out to High Plains Raceway to get a baseline read on it. Well, being professional racecar drivers total hooligans we couldn't resist throwing down a timed, hot lap. The result? 2:18.3, which is pretty damn quick for a stock car around HPR and is equal to the best of the hot hatches out there (within tenths of a second of both a GTI and Mazdaspeed3 I have driven at the same track). But what have 60 days and untold hours of labor by one of the best race teams in the business, done to our stout C30? 1:59 flat! A few ticks of the watch shy of a 20 second improvement over what is already a really good stock car. We knew what target time we were aiming for when we started, so it's gratifying to finally achieve it after everything that the crew at K-PAX Racing put into this project. Just to give you guys a point of reference, I have driven a Ferrari Scuderia around that same loop and my best time was in the 1:57 range. Not to shabby for our "grocery getter" Volvo, eh? Now that we're finished patting each other on the back, there's still work to be done. As successful as our initial test laps were, we still have several things to work on prior to the car being loaded up on the rig for St. Petersburg. The first thing we need to sort out is the handling. Out of the box the C30 was really solid but not up to the ten/tenths, knife's edge handling that we're gonna need to be competitive. Before we left the shop K-PAX Racing engineers Dax Raub, Aaron Coalwell, and Will Moody spent the better part of a day with the car on the scales getting a baseline set up on the car. The scale pads at the K-PAX shop are level to within thousands of an inch and computer controlled so that we can measure not only the overall weight of the car but also weight on each corner, cross weights, and front-to-rear and left-to-right weight percentages. On a front-wheel drive racecar we are looking for a 60/40 front-to-rear split and as close to a 50/50 left-to-right split as possible. In addition to the weights, our engineers use the hyper level scale pads to set and measure our front and rear camber and toe settings as well. These settings are crucial to getting our C30 to handle the way we want it to. How crucial you ask? Well a rear toe change as little as 1/16th of an inch is a major change! Once we got the shake down over with and were confident that there were no major bugs we needed to work through we got down to "twisting knobs." If you'll think back a few posts ago, you may remember my chat with Byran Hise at JRZ Suspension. I won't put you guys to sleep by going back over all that stuff, but lets just say we put all the things that we discussed in that post to good use and got the car much closer to where we wanted it. As the season progresses, the team will start to learn more and more about what the car needs to go faster and work better for us drivers. There are a lot of theories about how a front wheel drive car should be set up but at the end of the day, every car is unique. Only after spending gobs of time with the car being driven at the limit will a team start to understand how to get the most out of it. With set up done and out of the way, one of the other things we worked on during our test day was the new Sonic Intake Restrictor (SIR) that a number of series including SCCA Pro (who runs World Challenge) are looking at using to eliminate the need for the super strict boost control regulation on all forced induction cars. On a forced induction car, the more boost you can make, the more power you can make. Hmm…. real Einstein stuff here, Robb. I know. But here's the catch: manufacturers don't really care about controlling boost all that much on their street cars. As long as it's within a half a psi or so it's all good. The problem is that .5 psi of overboost could be worth 10hp or more. Great for us guys running a turbo, not so much for the NA (normally aspirated) guys. To further complicate matters, a lot of turbo cars work now days, the ECU doesn't necessarily ask for a specific boost number, instead it will ask for a mass airflow number. Which means we can't just go into the ECU and type in 19.5psi in "boost column" and get our required boost, we have to calculate the airflow required to hit that boost number. This ends up being a royal PITA because varying conditions have a huge effect on air density and therefore mass airflow. So depending on the current temperature and atmospheric pressure when you do the calc you could be under (low on power) or over (disqualified) boosted by several psi. As we are only allowed to be over boosted by a very small amount (and for less than 2% of any given lap) before being disqualified, we are very happy to be developing the SIR system with SCCA Pro and eliminating the traditional boost control requirements. The basic premise behind an SIR is that it is designed so that as the engine tries to pull more and more air through the restrictor, the velocity of that air increases exponentially. The restrictor is shaped and sized so that eventually the air passing through it goes super sonic. Once that occurs no more are can pass through, effectively capping airflow and thus limiting overall horsepower. Since an engine is basically a giant air pump, cap the air going into it and you cap the horsepower. Seriously cool, right? How well does it work? Too well. It's enough to drop over 4 mph from our top speed and 1.5 seconds from our lap time as soon as we put it in. I'm sorry, what's that you say? You want more? You want to know how our grocery getter stacks up against the rest of the competition? Hmmm… would some pre-race reporting from St. Pete be ok? How about some behind the scenes, race weekend details? Or maybe some in-car camera action? Ok, ok, You had me at that "Because Racecar." 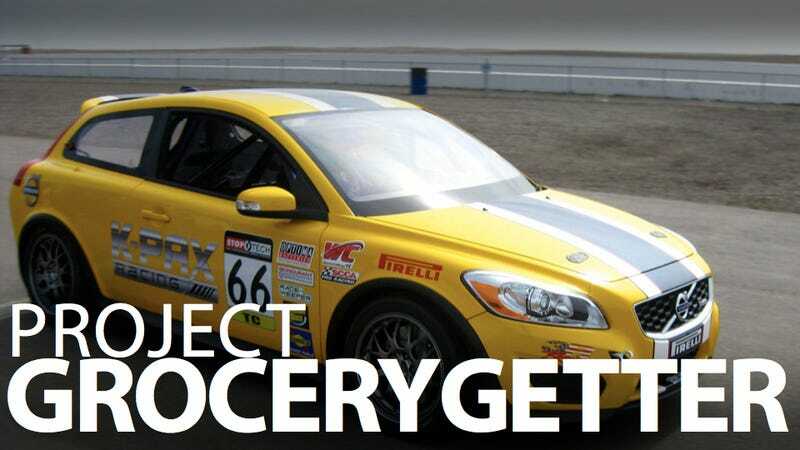 Stay tuned, and I'll bring you the maiden race weekend for our Project Grocery Getter, Volvo C30 live from St. Pete. Thanks for reading!